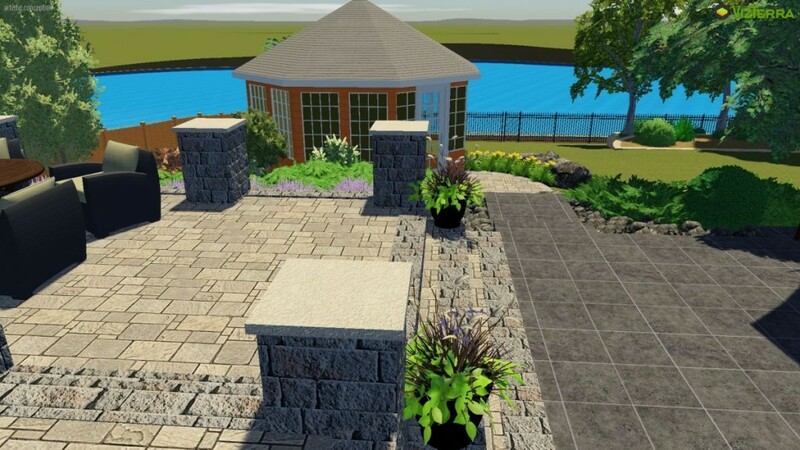 When starting your landscape design process, think of your yard just as you would your home; each room has a separate function and each person in your household has their favourite. This concept can be extended to the outdoors. Whether you have a large or small yard, consider creating multiple “rooms” to accommodate your needs and get the most out of your outdoor living space. – How many people live in your household? – Do you plan to host large groups of people? – Do you have pets? – What do you enjoy doing outdoors? – Would you like to have a space for a firepit/fireplace? – Do you need to a shady space? Our clients for this project asked themselves these very questions. Exploring their options with our 3D design software, we were able to incorporate three distinct outdoor sections into their backyard. Coming off of the existing back door, they wanted a dining area where they could keep a BBQ and large table, while still being close to the indoor kitchen. This dining space will be covered by a pergola in the future to further cultivate the feel of an indoor room. Pergolas are a great way to define a space without completely closing it in; their sturdy construction allows for numerous customizations such as lighting, curtains, shade, screening, or even a waterproof roof. Next to the raised dining area we installed a patio for entertaining large groups. This area takes advantage of an existing tree, which provides shade during hot summer days. The paving stones that we used for this patio are different than what we used for the dining area. Incorporating different materials throughout your design is another great way to create separation between spaces while increasing overall visual interest. And finally, we wanted to create an outdoor room that would take advantage of the wonderful backyard view. Our clients are fortunate that their property borders on a pond, so we designed a set of stairs that leads down to a smaller patio overlooking the water. This new patio was designed as a more intimate seating space, allowing for a greater degree of privacy while enjoying the space. Elevation changes (if possible) are a very effective design method for creating different rooms. Even adding a single step can greatly alter the perception of the space. Each area of this project serves a different function, while being easily accessible, beautiful, and unique. Check out our gallery for more great ideas!